Sorry! 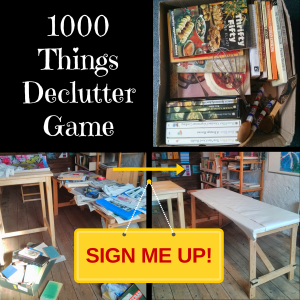 The 1000 Things Declutter Game has finished. The post is still worth reading though! How much stuff do you have in your life that you don’t use, need or even like? If you’re anything like me it’s probably more than you’d care to admit. Feeling overwhelmed by stuff seems to be part and parcel of modern day life and one way lots of us deal with this is to periodically have a good clear out of things in our environment. This desire to let go and simplify has been growing stronger in me over the last couple of weeks so I’ve set up a game to make decluttering fun and would like to invite you to play along. It all began when my daughter was nearing the end of her pregnancy and we went through some keepsakes we’d put away from when she was a child. Some of them were useful to her for the new baby and she duly took those home. Some of them she didn’t want but I felt sentimentally attached to so they went back in the box. Some were more suitable for a girl so, not knowing the baby’s gender at that point, they also went back in the box. Fast forward a few months . . . the lovely Cooper has been born and Rebecca needs another baby sleeping bag. I remember there is one in the keepsake box so out it comes again. By this time, Rebecca had decided that she didn’t want to return to work until she really had to, so she was planning to have a boot sale to raise funds. That made the decluttering easier, since we could let go of stuff that we thought might sell which in turn inspired us to be more ruthless generally. The following weekend John sorted out some stuff to take to the Municipal Dump so I took the opportunity to get rid of more stuff, this time items I’d collected with which to make some altered art. The truth is that altered art pieces are low down on my list of things I’m likely to create so I dumped, recycled or took to a charity shop the bits I’d collected for that purpose. That same weekend I came across a couple of articles about decluttering and, having been reminded of the sense of space that comes from letting go of stuff, I wanted to do more. I was inspired by a couple of Decluttering Challenges I found on the web and decided to create my own. However, although a part of me likes the idea of a “challenge” I’m not very good at sustaining the initial energy and enthusiasm that comes from the early high so I decided to tackle this more playfully. So, the ‘1000 Things Declutter Game’ was born.